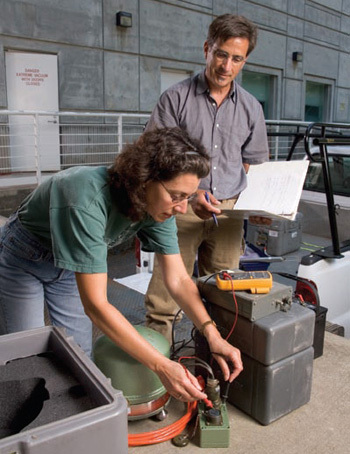 Seismologist Susan Schwartz and colleague Dan Sampson inspect GPS and seismographic monitoring instruments prior to a trip to Costa Rica. Photo by Jim MacKenzie. After installing an extensive network of monitoring stations in Costa Rica, researchers have detected slow slip events (also known as "silent earthquakes") along a major fault zone beneath the Nicoya Peninsula. These findings are helping scientists understand the full spectrum of motions occurring on the fault and may yield new insights into the events that lead to major earthquakes. A slow slip event involves the same fault motion as an earthquake, but it happens so slowly that the ground does not shake. It can be detected only with networks of modern instruments that use the Global Positioning System (GPS) to measure precisely the movements of the Earth's crust over time. Susan Schwartz, a professor of Earth and planetary sciences at the University of California, Santa Cruz, leads a team that has installed a permanent network of 13 GPS monitoring stations and 13 seismic stations on Costa Rica's Nicoya Peninsula. "At least two slow slip events have occurred beneath the Nicoya Peninsula since 2003," Schwartz said. "When we recorded the first one in 2003, we had only 3 GPS stations. By 2007, we had 12 GPS stations and over 10 seismic stations, so the event that year was very nicely recorded." The National Science Foundation (NSF) has funded the work by Schwartz and others to install monitoring equipment in Costa Rica. Schwartz, who directs UCSC's Keck Seismological Laboratory, has been working in the region since 1991. In a presentation on February 15 at the annual meeting of the American Association for the Advancement of Science (AAAS) in Chicago, she described results from the past decade of fault-zone monitoring in Central America. "The newest discovery is the occurrence of these slow slip events. But there has been a decade of focused effort in this area that has significantly advanced our knowledge of the Central America seismogenic system," Schwartz said. "Initially, we focused on areas of the fault that are locked up, which slip in an earthquake. The slow slip is occurring in regions that are not strongly locked, and a big question is whether that is loading the locked area, making it more likely to break, or relieving stress on the fault." Schwartz said she does not think slow slip events significantly increase the likelihood of a major earthquake on a locked portion of the fault. She noted, however, that scientists are still at an early stage in terms of understanding the implications of different kinds of fault motion and translating that information into earthquake hazard assessments. Flanked by active tectonic margins on both the Pacific and Caribbean coasts, Costa Rica is one of the most earthquake-prone and volcanically active countries in the world. Just off the west coast is the Middle America Trench, where a section of the seafloor called the Cocos Plate dives beneath Central America, generating powerful earthquakes and feeding a string of active volcanoes. This type of boundary between two converging plates of the Earth's crust is called a subduction zone--and such zones are notorious for generating the most powerful and destructive earthquakes. The slow slip phenomenon was first observed at subduction zones where hundreds of GPS and seismic instruments are deployed: the Cascadia fault zone (off the coast of Washington and British Columbia) and Japan's Nankai Trough. At these and most other subduction zones, the part of the plate boundary where earthquakes originate, called the seismogenic zone, lies beneath the ocean. But in Costa Rica, the seismogenic zone runs right beneath the Nicoya Peninsula. "It's a perfect opportunity to study the seismogenic zone using a network of land-based instruments," Schwartz said. The 2007 slow slip event in Costa Rica involved movement along the fault equivalent to a magnitude 6.9 earthquake. But it took place over a period of 30 days rather than the 10 seconds typical for an earthquake of that size, and such slow motion does not radiate the seismic energy associated with normal earthquakes. The instruments did pick up seismic tremor, however, which Schwartz likened to a lot of very small earthquakes. Tremor activity is also associated with slow slip events in Japan and Cascadia, but there are some differences in Costa Rica, Schwartz said. "Costa Rica has a different type of subduction zone from the well-studied ones in Japan and Cascadia," she said. "One thing that makes it interesting is that the temperature is much cooler at the depth range where slip occurs, and that is helping us work out the role of fluids in generating slow slip." Ultimately, the goal of this research is not only a better understanding of subduction zones, but also better assessments of earthquake hazards. Schwartz said her Costa Rican colleagues have been working to educate the population of Nicoya about earthquakes and related hazards. With a growing population along the coast, the region faces a potential tsunami threat as well as the possibility of a major earthquake, she said.